As mentioned in my previous blog, I started to rebuild my necessary home systems. Last year I was running some servers in my home lab, but my power bill was a shock! I decided to replace everything with a HP MicroServer. Since two months my HP MicroServer is doing a very good job. 🙂 It’s a very fast and economical system. It consumes about 76 Watt. I installed four 2 TB Seagate disks and connected them to a HP SmartArray P410 controller with 512 MB BBWC. The storage is incredible fast. I’m running a RAID-6 ADG with 4 TB usable capacity. VMware ESX 4i is booted from an USB stick. My file and media server is entirely virtualized. I used CentOS 5.6 as base system and attached four 1 TB virtual disks. I grouped the four disks with LVM2 and my data is striped across all disks. An additional CentOS 5.6 system is dedicated for network services including NTPD, DNS, DHCP and even DHCPv6. 🙂 My network is IPv6 enabled and I’m running my own IPv6 prefix provided by sixxs.net. 🙂 The HP MicroServer with 8 GB RAM is capable to run even more systems parallel. Quick trys don’t requires to turn on my home lab in my cellar. That’s very comfortable. 😉 And I’m saving round about 4.000 kW/h per year. 😀 That’s lot’s of money. 🙂 Thank you HP for this great server!!! First of all: I like your blog, lots of „nerdy“ topics and many pictures of beautiful hardware – like the MicroServer. A few weeks ago, I had the same problem like you. I watched my power usage and decided to replace my two old Proliants (DL140 and Dl380) with a new „big one“. 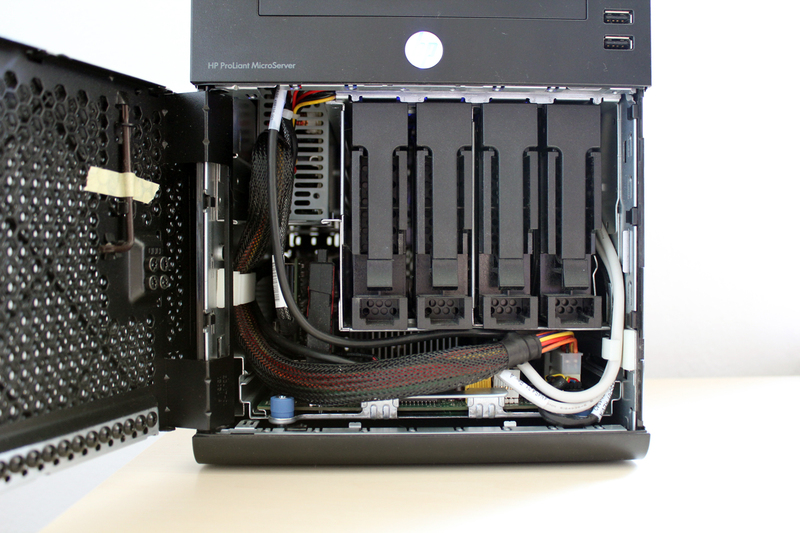 While searching for the best hardware for a little money, I discovered the MicroServer, too. „Tiny beautiful box, power saving, sounds good – but what’s with the cpu power?“, I thought. I haven’t tried the machine, because I’m playling a lot with virtual machines and thought, that the 1.2 Ghz dual-core wouldn’t be strong enough for my requirements. Too bad, that there no options to upgrade the MicroServer. At least, I built my own server using a AMD Phenom 1090T (6×3.2 Ghz) with 16 GB of DDR3 RAM and a SSD as boot drive. For storage I used 2 500 GB hard drives. After a few weeks, I’m still totally satisfied with it – the system has enough power for „future upgrades“. You’re playing a lot with virtual machines too, don’t you? I’m reading your blog for a few weeks – is that machine really strong enough for your requirements? Can’t imagine after reading, what experiments you’re doing in your lab. If I need more power I can turn on my home datacenter. 🙂 And if I finished all my testings I can turn it off and save money. 😉 That’s why I bought the HP MicroServer! i bought my new microserver one week ago. can you tell me something about your „additional“ hardware? do you even run an hw raid setup? the smart array controller is pretty expensive 🙁 can you please tell us something about the performance of the raid 6 array? The SmartArray is doing over 200 MBytes/sec. write and read! A Linux virtual machine is doing between 100 and 150 Mbytes/sec. read and write. The filesystem and the right configuration of the filesystem is very important to get max. performance. But it’s very time consuming to get the best configuration. I’m currently very satisfied with the performance. Currently I’m running a trial key. But I will buy soon the Smart Array Advanced Pack. Can I ask which version of the Microserver you are running with the P410 contoller? Did it arrive with the 250GB or the 160GB hard drive? I’m asking because I have the 160 GB hard drive with 200 watt power supply version/model, and RAID card does not seem to allow the Microserver to POST. I don’t think it’s getting enough power to run the raid card. The PCI slot works with other cards that requires less power to run them and the RAID works on other systems. Can you tell me where you mounted the 512 battery cash in the chassis. I put the battery cache into the 5.25″ bay at the top of the HP MicroServer. Do you connect the P410’s mini SAS to the mini SAS connection on the Microserver’s motherboard? Can you get away with this? How do You setup the P410? I bought one but I can’t figure out how to make it work. When i wan’t to install ESXi – theres no hard drives. got the same server since last week and I’m very satisfied with it. Too bad, that my existing HP SmartArray P400 won’t fit due to the wrong cable port (SFF-8484 instead of MiniSAS). Because of that there’s no adapter for those ports, I need to buy a new controller. Where did you get your P410 from? Did you bought it included to the server or from somewhere else? I’m thinking about buying a P410 or P212. Has anyone testet „unsupported“ configs wit 8GB ram modules? To answer all questions. 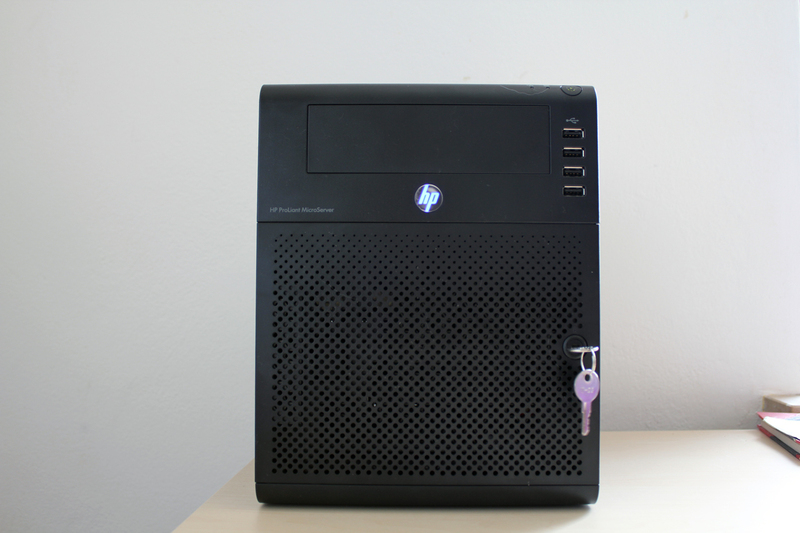 I’m running the HP MicroServer version which was delivered with the 250GB hard drive. I installed the HP P410 controller with 512 MB BBWC without any problems. I’m using the installed Mini-SAS cable and connected it to the P410 controller. I configured the RAID with the HP ACU offline version. I created one 4TB large RAID ADG virtual disk und splitted it into two volumes, because ESXi cannot format LUNs larger than 2 TiB. 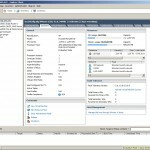 I installed the VMware version of ESX 4i onto an USB stick. Same here 8gb ecc – p410/512 BBWC (this controller can run without a battery and caceh if you dare) if you are poor the p400/256 goes for $25 used (batteries are not compatible! they look identical but there is a chip that tells the p410 the battery is not for the p410) . then you cut down an hp nc360t dual nic to 1x (hacksaw?) and it is cool. use an 8gb flash or ssd – 2gb SLC flash is required for enteprise esxi use – $70 – it would be cheaper to find a sata ssd drive and underprovision it or use the extra space for paging (!!) in esxi5 – if not make sure you get 16meg/16meg read write speed – the patriot xt line seems to work good – get 8GB esxi does something different iirc – google it i’m not sure if its 8gb per copy or partition (2 per usb stick) – newer hp gen8 can actually do some sort of redundancy between two usb/sd devices for sdhc without raid. but i’d rock a intel 40gb ssd (320) or something – they are worthless now that win7 requires 60gb ssd’s to rock out (windows/office/service packs/8gb swap/hibernate/yadda) so rocking 1 sata ssd might not be a bad idea cost wise. do not use a freebie mlc 1-chip usb key unless its just fun – you will realize that $40 intel ssd underprovisioned to 2gb or 8gb may be more resilient due to underprovisioning (X25-m has built in garbage collection). works great. 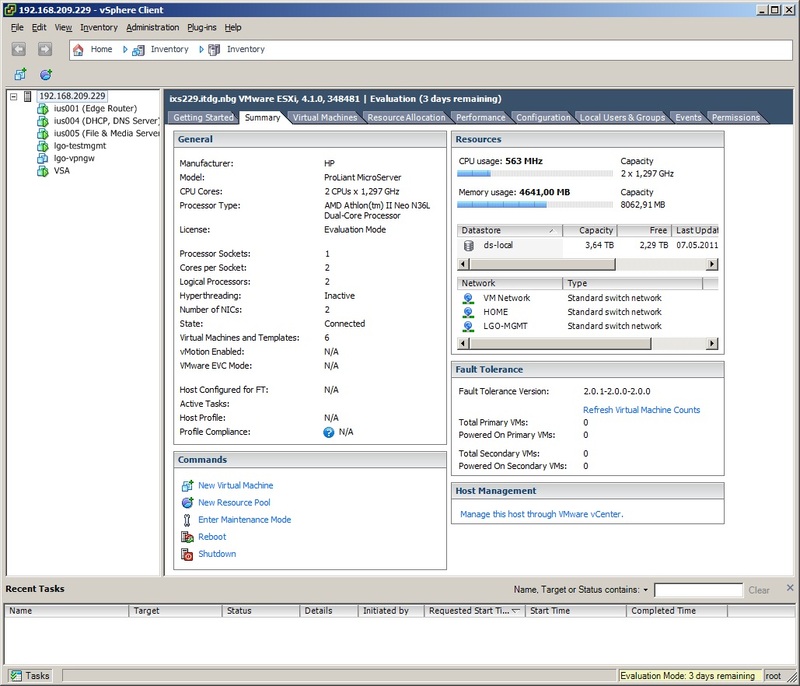 have vcenter in a vm, copy of veeam for emergency, AD server, pfsense router (hence more nic ports). Does the battery for the P410 have to sit in the 5.25″ bay? I already have this area occupied with an additional SATA disk. I’m looking for a server to practice and keep my skills updated. I’m torn between the Microserver with AMD Turion II Neo N40L or the more expensive ML 110 G7 with Intel E3-1220 (3.1 Ghz) Quad-Core CPU. I need to run a windows environment so am looking to run say 6-7 servers at a minimum, they won’t be doing much most of the time but need to be on to complete the infrastructure. Do you think the Microserver could run this many servers and can the virtual servers be 64 bit with the AMD CPU?. The microserver comes with 8 GB of RAM. I know every user is different, I’m tempted to pay more and go for the ML110 but only if I need to.